he wanted to make shoes. Margins of his most-loved childhood books were filled with well-intention-ed and purposeful drawings, and the cover corners were inked in with spins and swirls of shoe prints. Left alone with school work, he copied the lines and patterns of insteps and ankles instead, ever in awe of the heel toe pivot bend of a shoe well-worn, and, hidden in a cubby behind his bed he kept mate(less) shoes he found -- mostly lonely toddler Velcro specials, an occasional sports lace-up, and even one boot he found beside a park bench. Scattered within were the colored pens he used to draw on the their sides, magically transforming shoe to art, and sole into a fiesta of whimsical color. And though the songs on his playlist faded from one to the next without stopping, he did see the looks of surprise turned pity turned ridicule around him. He saw the laughter in an avoided glance. And sometimes the shouts he attracted bled through the music in his soul, crumpling his masking(s). 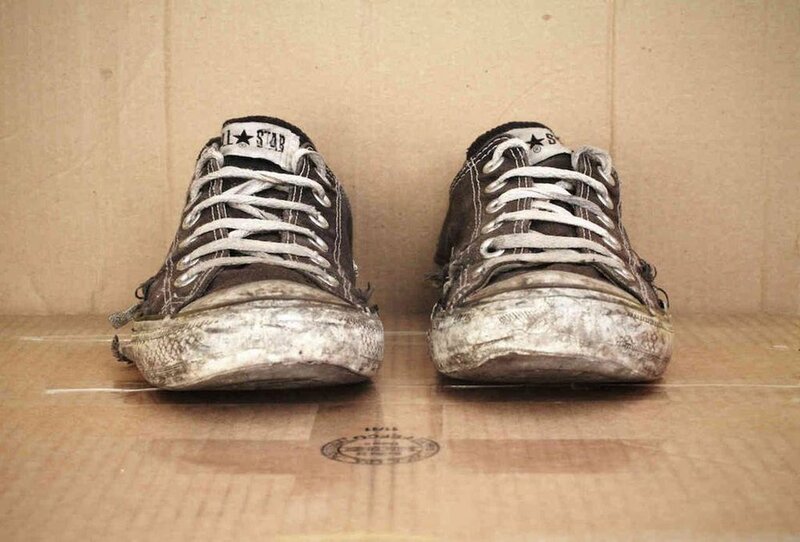 And on those days, he mistook his shoes for himself, the laughable creative mismatch of hope and a never-fitting pride became his imperfect foundation. So, as soon as he was old enough, he began to buy shoes. He could make his own, but his hands refused to capture the unobtrusive, stripped of character and dulled even further shoe that would guarantee peace-filled walks unseasoned by the laughter of past remembering(s). He attached himself to strangers who knew nothing of the shoe cubby he still held dear, now a mix of old and new, with designs abstractly intricate and popping with color unexposed, until the blandness of that (un)moving space pressed on his chest and bargained with his breath, nearly leaving him color blind. With nothing but hope in his pockets, and a simmering determination, he left that place. He walked. And walked. And walked his dream back into innocence. He was still a boy who wanted to make shoes. And so, he did. He copied all the shoes he wanted to wear growing up, adding his signature patches of bold patterns and flaming color until time loosened passion and his shoe making bloomed like a night flower. Craft became art. Donning a new name, and a vow to never look back, he took his colorfully clad feet only forward, imagining the footsteps of each yesterday burning away with the coming dawn. What happens to a past unremembered? Does it fade away into a faint meandering of the mind? Does it become an uncomfortable pause? A recurring dream? Or does it hide and gather strength in the shadows of the breath, feeding on forgotten footprints, waiting for the right moment to ambush a forward walking wanderer? His (un)remembering took all these forms, the pauses growing longer and longer with each year and each shoe making success. All the forward moving determination rewarding him beyond his dreamings. It was there in that beyond, that out-between place of awe and (dis)rooted-ness that the ambush began, as a barely felt gnawing - a tiny hunger just behind his rib cage that bewildered him because he couldn’t figure out what he needed to quell it, or what it actually was. He tried sampling new colors, gorging on wilder patterns, filling his spare moments with trips to faraway places with hopes of satisfaction... inspiration... but the hunger grew and gnawed, and nibbled and chewed...and afraid of sinking he kept walking, walking, and walking he walked himself still forward into a not-real beyond where he couldn’t remember why... he was there... in that place. Flailing. Uprooted. Weightless. (And) willing his feet to take hold, to grow rooted he commanded his eyes to see something to grab on to that would bring him stilled life. Something other than the new he created, which still loomed large and daunting and ravenous for the all of him. In that grasping and flailing and thrusting and collapsing, he forgot his vow and looked back. And with a glance, the promise he made to his young self crumbled - the breaking feeling impossible and too, intoxicating. He blinked and breathed through the distant and familiar feeling of slowed circulation, a feeling that at one time overcame him with an ice-like numbness topped with a budding and energy stealing panic making the slightest movement impossible. And even then, he willed a leaning. He willed his entire Self to turn, but he simply could not. But the remembering had brought a moment of stillness, a moment of weight. And so, and so, with his feet feeling the ground below, and a body unable to turn, he decided to walk backwards. Slowly, carefully, then quickly, unaware of it’s dangers - the ability to see into the periphery along with the heightened senses of the spine fooling the heart into false invincibility. And as he walked backwards, he sighed as he relived his unraveling, gasped as he again felt the bites of his-story beckoning with sharp tiny teeth, and moaned at his step into the borderlands of success. And with purpose he continued, perfecting his toe-ball-heel motions, becoming accustomed to the sensations of his back body. He still wasn’t prepared to revisit the year he tried to live outside of color, and he shouted at that Self, prodding him to live loud not yet knowing or understanding that his past could not change. He kept walking, daring the taunters of his childhood to see him now, out screaming them and creating a verbal soundtrack that boosted his rantings and cancelled out all else. He tripped over his fear, ripped open old masks of indifference, and scratched through shameful rememberings until he could steadily walk backwards inside his yesterworld, and make his way to the familiar feel of home. And on that threshold, he stopped walking, (and) with a newfound agility, he turned. Knowing that the thing he’d been forward walking away from, lived just behind the door he now touched (and) it might overtake him (and) he stepped forward, and in anyway. The seed of himself held and planted along the way quickened, and a tiny root sprang forth. And there in that place, in that full space of awareness, a place that held the truth of all that he was, he found room to begin anew. A place where he could wear his name again, and grow free.